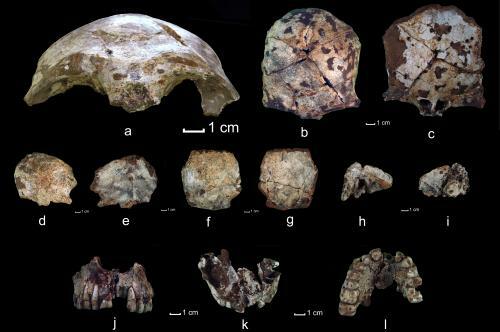 An ancient skull recovered from a cave in the Annamite Mountains in northern Laos is the oldest modern human fossil found in Southeast Asia, researchers report. The discovery pushes back the clock on modern human migration through the region by as much as 20,000 years and indicates that ancient wanderers out of Africa left the coast and inhabited diverse habitats much earlier than previously appreciated. The team described its finding in a paper in Proceedings of the National Academy of Sciences. The scientists, who found the skull in 2009, were likely the first to dig for ancient bones in Laos since the early 1900s, when a team found skulls and skeletons of several modern humans in another cave in the Annamite Mountains. Those fossils were about 16,000 years old, much younger than the newly found skull, which dates to between 46,000 and 63,000 years old. "It's a particularly old modern human fossil and it's also a particularly old modern human for that region," said University of Illinois anthropologist Laura Shackelford, who led the study with anthropologist Fabrice Demeter, of the National Museum of Natural History in Paris. "There are other modern human fossils in China or in Island Southeast Asia that may be around the same age but they either are not well dated or they do not show definitively modern human features. This skull is very well dated and shows very conclusive modern human features," she said. No other artifacts have yet been found with the skull, suggesting that the cave was not a dwelling or burial site, Shackelford said. It is more likely that the person died outside and the body washed into the cave sometime later, she said. The find reveals that early modern human migrants did not simply follow the coast and go south to the islands of Southeast Asia and Australia, as some researchers have suggested, but that they also traveled north into very different types of terrain, Shackelford said. "This find supports an 'Out-of-Africa' theory of modern human origins rather than a multi-regionalism model," she said. "Given its age, fossils in this vicinity could be direct ancestors of the first migrants to Australia. But it is also likely that mainland Southeast Asia was a crossroads leading to multiple migratory paths." The discovery also bolsters genetic studies that indicate that modern humans occupied that part of the world at least 60,000 years ago, she said. "This is the first fossil evidence that supports the genetic data," she said. The researchers used radiocarbon dating and luminescence techniques to determine the age of the soil layers above, below and surrounding the skull, which was found nearly 2 1/2 meters (about 8.2 feet) below the surface of the cave. Researchers at Illinois used uranium/thorium dating to determine the age of the skull, which they determined was about 63,000 years old. Research fellow Kira Westaway, of Macquarie University in Australia (who dated the soils around the famous "hobbit" fossil found on Flores Island in Indonesia in 2003), conducted the luminescence analyses. These techniques measure the energy retained in crystalline particles in the soil to determine how much time has elapsed since the soil was last exposed to heat or solar radiation. She found that the layer of soil surrounding the fossil had washed into the cave between 46,000 and 51,000 years ago. "Those dates are a bit younger than the direct date on the fossil, which we would expect because we don't know how long the body sat outside the cave before it washed in," Shackelford said. "This fossil find indicates that the migration out of Africa and into East and Southeast Asia occurred at a relatively rapid rate, and that, once there, modern humans weren't limited to environments that they had previously experienced," she said. "We now have the fossil evidence to prove that they were there long before we thought they were there." More information: "An Anatomically Modern Human in Southeast Asia (Laos) by 46 ka," PNAS, 2012.